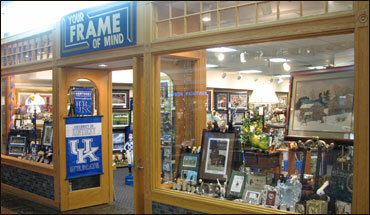 YOUR FRAME OF MIND GALLERIES was formed in 1982 primarily as a custom framing business. From there it evolved into a gallery carrying collector prints and posters. When we opened another gallery in downtown "Lexington" we added a gift line to cater to the tourists. We try to concentrate our print, poster, and gift lines so that they relate to the Bluegrass Area, including equine art and gifts and University of Kentucky items. If you are looking for that perfect gift that represents what Lexington is about, come find it at Your Frame Of Mind Galleries.